At “Re-Envisioning New York’s Branch Libraries,” five teams recently presented design ideas like this one from a group led by architecture firm Marble Fairbanks. “A lot of us have been walking around the city for decades and looking at libraries and post offices and all sorts of civic institutions and just thinking … there’s a great chance to do a win-win,” David Kramer said at last week’s Re-Envisioning New York’s Branch Libraries. Kramer’s a principal at NYC-based real estate developer Hudson Companies. The firm recently won the bid for the Brooklyn Heights Library Redevelopment Project, which plans a “state-of-the-art” branch in a mixed-use space, and 110-plus units of affordable housing off-site. At a time when many libraries are reinventing themselves, the Re-Envisioning event was a chance for five design teams to present ideas for the future of New York’s branch libraries. Beyond the potential of the city’s 207 branch libraries, and beyond sleek, modern design concepts and developer deals for affordable housing, it’s clear there’s a need to address some foundational problems in New York’s system. From the team led by architecture firm Marble Fairbanks, Karen Fairbanks opened with the recommendation that the city’s three independent library systems plan together as if they were one entity, because, she argued, “When we think of libraries as a network system and social infrastructure related to other public services, the libraries can help address both citywide systemic issues and respond to social needs of their neighborhoods.” According to a Center for an Urban Future report, the libraries have $1.1 billion in capital needs and uneven, unreliable operational support from the city, even as usage grows. New York’s Manhattan, Queens and Brooklyn systems aren’t officially part of the city, yet they do receive some public funds. It’s a sort of stepchild relationship that has put the libraries in the same state as many of the country’s bridges: lots of people relying on them, no clear responsibility to pay for them and disrepair. The team created a data tool that made it possible to overlay several kinds of public data in order to help the city and system make the best decisions about where to put branches. For example, where are there freelancers who use the library for research and where are people most in need of adult education? Which neighborhoods have more seniors or more youth, and — an issue that kept coming up given New York’s focus on building resilient infrastructure — which are in evacuation zones? 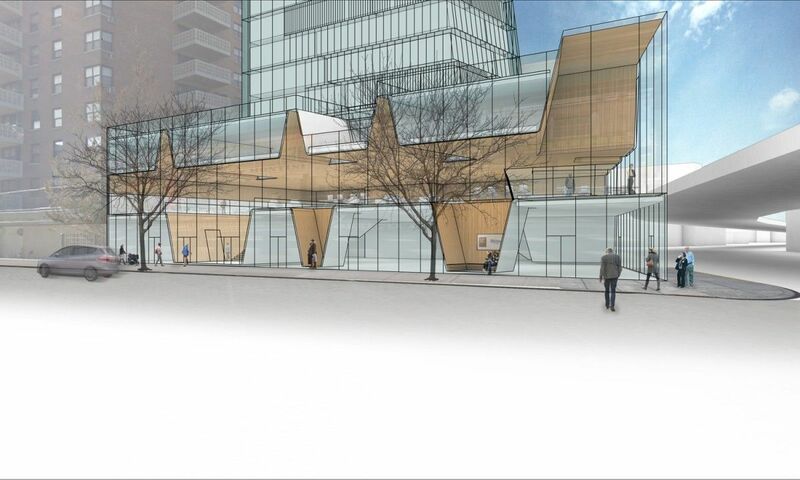 The team’s conceptual redesign for the Brighton Beach branch of the Brooklyn Public Library would take advantage of rezoning and resiliency bonuses. At the base was a much larger branch, one with its main space elevated off the ground above flood level, but with programming space on the ground level. Above the library was a mixed-income apartment building. The design team also presented policy proposals around rezoning libraries that would allow them to add more square footage that could be used for both more library space and to provide a critical component of Mayor Bill de Blasio’s affordable housing plan.